Our sweet boy was born in April of 2018. He is our first child and is perfect in every way. Our cranio journey began at his 1 month appointment. I remember writing “head shape” on the section for concerns on paperwork that I filled out for this appointment. Something just didn’t look right to me. Our pediatrician felt around on his head and told me that she thought he had Craniosynostosis. Of course I had no idea what that was, so she started explaining. I don’t really remember much else from this appointment because once she brought up neurosurgeons and skull reconstruction, I lost it emotionally. Looking back now, I am so glad that she knew what Cooper had and was able to refer us quickly. My husband and I took Cooper to a plastic surgeon, neurosurgeon, hematologist and a geneticist throughout the summer. 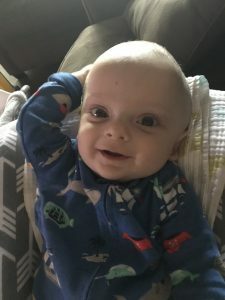 A cranial vault reconstruction (CVR) was scheduled for sagittal craniosynostosis at the end of September when he would be 5 months old. Waiting for the surgery date was so hard. I got upset every time I thought about my baby’s surgery. I tried to stay busy as much as possible. The day of the surgery was rough. My parents, my aunt and a good friend came to the hospital to wait with my husband and I. We gave Cooper to the nurse at 7:50am and did not see him until 3:45pm. Our surgeons nurse called me every few hours during the surgery to let me know how it was going. That helped a little. The surgery went well! We stayed in the PICU the night of the surgery and then in a regular room for two more nights before going home. Cooper needed a blood transfusion and had an allergic reaction to morphine the day after surgery. I was so nervous to take him home! Cooper is currently 11 days post op as I write our story. Honestly, except for having a scar across his head, no one would ever even know he had surgery. He is completely back to his normal self! It’s AMAZING! Everyone told me that babies are so resilient and bounce back fast. I didn’t believe them until I saw it for myself. Our little man is a trooper! I’m sharing our story because reading others’ stories throughout our journey helped me. I am so thankful I found this organization and connected with several mothers that were going through the same process.